I grew up in London, Ontario and left to go to the University of Guelph in 2002. I now live in Guelph with my wife and our dogs. I work at Conestoga College as the Coordinator of the Bachelor of Applied Health Information Science degree program. I recently finished my PhD at the University of Waterloo. In my spare time me and my wife often train for triathlons. Things never quite end up the way you think. For me, I never thought I'd work in Health Informatics, I never thought I'd go to grad school, and I sure as heck never thought I'd be training for Ironman distance triathlons. These have all be surprising, but really cool, developments in the last 10 years of my life. How did I start a career in Health Informatics? The Guelph Computer Shop, RIP. If 10 years ago you'd told me I would end up in the field of health informatics, my first question would have been "What the heck is health informatics?". 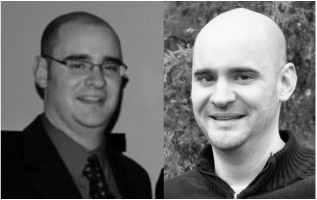 As an Engineering Systems and Computing graduate from the University of Guelph, I suppose my calling to health informatics was less spiritual and purposeful than somewhat circumstantial and accidental: it was a typical newage find-your-career-path scenario. Oddly enough, my career started at a small computer store called "The Guelph Computer Shop". 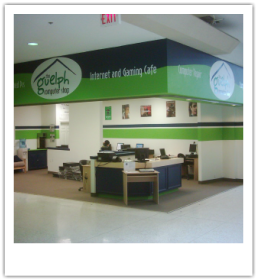 This was a small business that I had created in 2005 during a Co-op term while at the University of Guelph. I opted for this route after a rather pointless (and career changing) experience at CIBC's Internet Channel. That job was so mind-numbing that I decided I should work for myself instead. Obviously, in hindsight this was extremely Gen-Y of me but it did seem like a good idea at the time. Sure, running your own business sounds like a good idea when you're young and enthusiastic, but as it turns out it's not a hip thing to do and NOT all the cool kids are doing it (I haven't decided if the cool kids are smarter, or less enthusiastic). Running you own business at 21, while attending school full-time, is actually a hugely time-consuming, non-profitable learning experience that teaches you more about yourself and the real-world than a job at CIBC. Getting knocked down a few pegs in this era of my life was really good for me. After 2.5 years running the store I had reached total sales of $750,000, but still wasn't able to make things work. I ended up closing 'The Guelph Computer Shop' and selling whatever useful bits and pieces that I could. It's worth noting that this ended right around the time the economy blew up: while I'd love to say that my failure to succeed in retail was related to the American housing market and the 'greatest economic crisis since the great depression', so maybe I did OK all things considered. Though me and my wife have quipped didn't end up feeling that downtown Guelph was a great place for my business, in truth my geographic location during the period of my life is what lead me to make contact with the Guelph Family Health Team in its very early days. This eventually turned into a full time job after I closed the store, and is ultimately the main reason I starting working in healthcare as an "Information Systems Specialist". I really enjoyed my 5+ years at the Guelph Family Health Team and learned many things. Because the organization was small and there were few opportunities to grow in the long term, I joined Conestoga College in 2012 as their Health Informatics Technologist. Though I was a bit shell shocked in my transition from a 80 person organization to a 900+ organization, I'm excited and proud to work at the College. When I finished my undergrad at Guelph, I recall explicitly telling my parents that "I never want to do a Masters or a PhD". I had turned my nose to academia as a ongoing pursuit. It didn't take long for this to change. As it turns out, my grades weren't a major impediment to graduate school and in 2010, when I had 'future career growth' on the mind I was accepted into UVic Masters of Science in Health Informatics, Distributed Stream program. Though I wasn't sure what to expect, it turns out that "teedious" schooling in synonymous with "Undergraduate Engineering", and "fun" schooling is synonymous with "Graduate Anything-Else". And as it turns out, there are far worse things than having to spend 2 weeks in Victoria, BC. Overall, I enjoyed the program, and was pretty good at it too. I won some awards, got most of my tuition covered and got out a nice publication in Methods of Information in Medicine. Though it was a full-time program and I worked full time, I managed to get my Masters out of the way, from start to finish, in about 19 months. Some have asked me how I pulled it off, and I suppose I have to blame the time management skills I acquired during The Guelph Computer Shop Shenanigans (see above), support form my employer and support from my wife. This was my final design project in undergrad. It was a carpal-tunnel-risk-detecting-keyboard system. No patent pending. This was supposed to be my last academic endeavor. By the time I finished my Masters at UVic, I had started working at Conestoga. It was quickly pretty clear that I'd need to arm myself with a PhD in order to progress in the short and long term. Based on a desire to do more research in my domain, to improve my research skills and to achieve various long term career goals, I decided to start a PhD. Deciding to 'relax' this time around, I registered part-time at the University of Waterloo with the Advanced Interface Design Lab in the Department of Systems Design Engineering. I also managed to get Telus Health to work with me through an NSERC Industrial Partnership Scholarship, making my work a little more real-world. Though the University of Waterloo campus isn't necessarily my favorite, the people are great. I'm quite happy with my decision to take on this work. My adviser, Catherine Burns, was the best. I defended and finished in Spring 2017. A video summary is below. Go for a run? Seriously? Circa 2008, vs Circa 2013. In the summer of 2004, I worked in Downtown Toronto for CIBC's Internet Channel. Other than being an important career changer for me (for all the wrong reasons), it was during that summer that my roommate at the time suggested we go for a run. In a very jerkish way, I said absolutely not. Nobody had suggested I run or do exercise before, and I was not keen. It was Spring 2008 when my wife Jaimie told me she was interested in doing a running clinic at the Running Works and that I opted to support her and give it a try. Slowly we built up to our first 5KM in Grimsby, Ontario. That race was far from the 'end' of exercising for us... Over time we increased our distances and speed, and we got much healthier overall. What we had once considered our 'long walks' have turned into 'short walks' and through running and exercising I got a better handle on my 'cholesterol issues'. The pictures speak for themselves! ​After the running clinic, Jaimie wanted to check off a triathlon from her bucket list so we upped the anti and progressed to various combinations of swimming, biking and running. We did 6 events in our first summer at the Try-a-Tri and Sprint distance. I suppose I can blame Jaimie again for 'signing us up' for this, but its done nothing but further increase my overall health. As a really useless and confused swimmer, it took me several years working with Miguel Vadillo to get my swimming to a decent place. I had trouble doing 50 meters and worked to 4Kms of continuous swimming over time. These days we've embraced the Ironman distance. We competed in Ironman Wisconsin in Summer 2014 and Ironman Mont-Tremblant in Summer 2016. 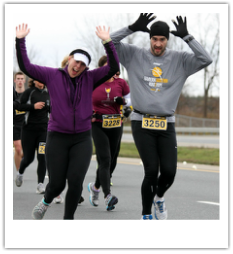 Me and Jaimie at the Hamilton Road-2-Hope, our first Half Marathon, in 2012. 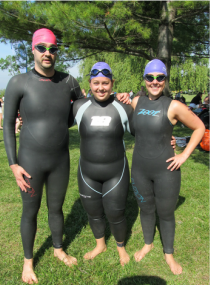 Me, Rhian (Jaimie's sister), and Jaimie at Guelph Lake One Triathlon, 2013.